We’ve all heard the famous sayings “The cobbler’s children go unshod” and “doctors make the worst patients“, well in our case both of these adages hit awfully close to the mark. But no more! We are proud to welcome you to the freshly baked, brand-spanking-new, rebranded and rebuilt ASK Advertising website! Sometimes getting around to your own updates takes a backseat to completing pressing client projects, our website has been a casualty of this prioritization. And now, we are relieved to finally have our new website up and running so we can promote our great clients and projects that we’re so proud to have had the opportunity to work on. Hopefully you, our website guests, will be inspired by our portfolio of creative design projects and see something that ignites that spark in your mind. 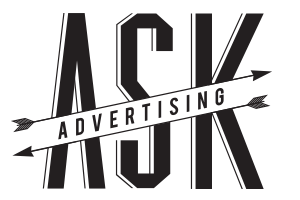 As we all prepare for the new calendar year and revise our marketing plans we hope you will consider adding ASK Advertising to your creative team. Feel free to connect with our office anytime to launch your new website, digital marketing or graphic design project. We hope you enjoy the new site and connect with us soon.